He is best known through the medium of the writer Philostratus, in whose unreliable biography some have seen an attempt to construct a rival to Jesus Christ. 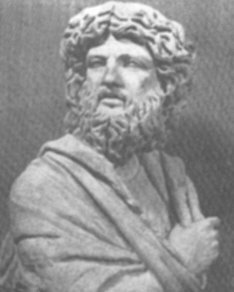 Apollonius was a vegetarian, and a disciple of Pythagoras. He is quoted as having said "For I discerned a certain sublimity in the discipline of Pythagoras, and how a certain secret wisdom enabled him to know, not only who he was himself, but also who he had been; and I saw that he approached the altars in purity, and suffered not his belly to be polluted by partaking of the flesh of animals; and that he kept his body pure of all garments woven of dead animal refuse; and that he was the first of mankind to restrain his tongue, inventing a discipline of silence described in the proverbial phrase, "An ox sits upon it." I also saw that his philosophical system was in other respects oracular and true. So I ran to embrace his teachings..."
He was born in the city of Tyana, in the Roman Empire province of Cappadocia in Asia Minor. Educated in the nearby city of Tarsus, his life took on nearly legendary proportions when, it is said, he visited Rome and raised the daughter of a senator from the dead. He wrote many books and treatises on a wide variety of subjects during his life, including science, medicine, and philosophy. His scientific theories were ultimately applied to the earth-centered Ptolemaic idea that the sun revolved around the earth. A few decades after his death, the Emperor Hadrian collected his works and ensured their publication throughout his realm. Some scholars, both ancient and comtemporary, believe that Apollonius was actually the Christian Apostle Paul, as many of his teachings coincide with those of Paul, and Apollonius is said to have done many of the same things Paul did. But there is no concrete evidence of this. His fame was still evident in 272, when the Emperor Aurelian besieged Tyana, which had rebelled against Roman rule. In a dream or vision, Aurelian claimed to have seen Apollonius speak to him, beseeching him to spare the city of his birth. In part, Aurelian said Apollonius told him "Aurelian, if you desire to rule, abstain from the blood of the innocent! Aurelian, if you will conquer, be merciful!" Aurelian, who admired Apollonius, spared Tyana. Medieval Islamic alchemist Jabir ibn Hayyan's Book of Stones is a lengthy analysis of alchemical works attributed to Apollonius (called "Balinas") (see e.g. Haq, which provides an English translation of much of the Book of Stones).